The “window repair project of colossal proportions” is about to descend upon the historic Mallory-Neely House! The contractor, along with his entourage of workers and equipment, will be arriving shortly. But before their work can begin, the house must be made ready – and this involves no small to-do list. At an average house before the start of an average repair project, preparations might involve sliding a few chairs and tables out of the way, scooting a vase or two aside, or laying a drop cloth on the floor. The Mallory-Neely House, however, is not average and neither are the preparations for the monumental repair project that will return its 91 windows to their original, 19th-century glory! This project involves a 16,000 square foot mansion filled with original furnishings, and artifacts and treasures from around the world! There are 25 rooms lined with 91 masterpiece windows that are awaiting their transformations. So – the hatches should, indeed, be battened down! One: Protecting the House and Everything In It. Special Movers. The Collections Staff, who specializes in handling artifacts, will be the group designated to move, remove and protect all the items involved. Accessioned Inventory. Each accessioned piece of furniture, each painting, photograph, book, pin cushion, letter opener, hairbrush and comb, knife, fork and spoon, and the like – will be logged in inventory and carefully packed away into storage. Special Protection – Stained Glass. Large pieces of stained glass which adorn two of the windows in the house do not require repair, but will need to be protected – protected from ladders and equipment being moved past them on a daily basis. 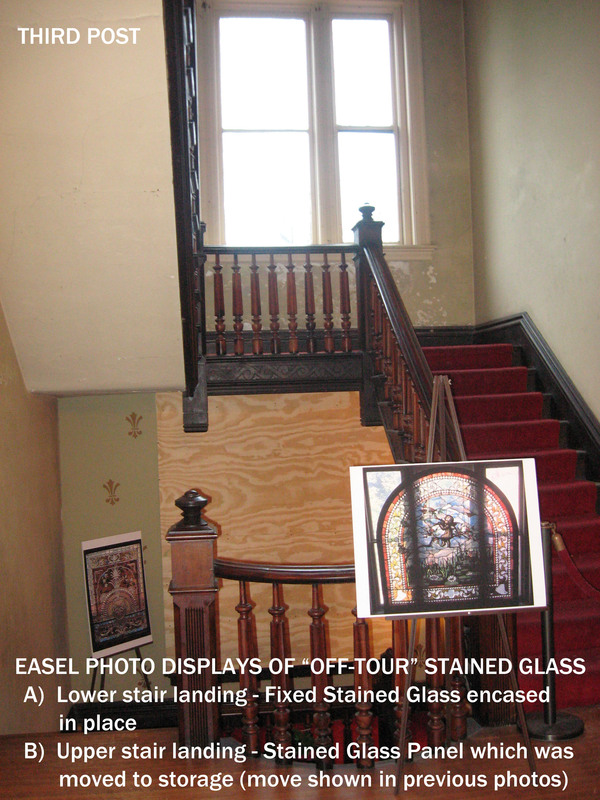 One permanently-installed stained-glass piece will remain in place, guarded with a custom-built encasement. The other piece of stained glass, which is a removable panel, will be detached and moved to a storage area. There it will be encased inside a carefully, measured-to-fit plywood case. Phasing. It was determined that the repair work must be done in phases in order for the House to remain open to the public during the course of the project. Each repair phase will affect only a small area of the house at a time so that the visitors will still be able to thoroughly enjoy everything our tours regularly have to offer. Coordination of Rug Removal. The dismantling process of artifacts and furniture in each room needs to be coordinated with Joe Remmers, who owns J. Remmer’s Rug & Specialty Cleaners. As described in a recent issue of The Museum Scope newsletter from the Pink Palace, Mr. Remmers has graciously donated his services to clean each rug in the Mallory-Neely House. The perfect time to have each rug removed for cleaning is in conjunction with the removal of that room’s contents during the window repair project. Photography Disiplay. An easel will be placed outside each room that is under repair. The easel will display photos of the room and its contents so that guests may still be able to see the room as it appeared before it was dismantled. Photos of the stained glass mentioned above will also be displayed on easels. Three: Creation of a Workshop. The disassembly and restoration of 91 windows with utmost historical accuracy requires an on-site workshop for the contractor and his crew. In order to accommodate this, a good portion of the 3rd floor of the Mallory-Neely House has actually been transformed into a temporary machine shop and set of workrooms. Furniture and other items had to be moved and stored. Temporary walls of stud framework have been constructed with plastic sheeting attached as “temporary sheetrock.” This will keep much of the dust and debris confined to the third floor where the carpentry, construction and assembly is taking place. This post was written by Jamie Boelter, Mallory-Neely Staff.